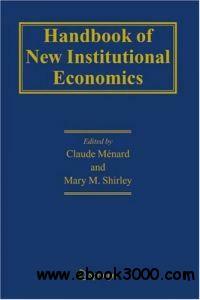 New Institutional Economics (NIE) has skyrocketed in scope and influence over the last three decades. This first Handbook of NIE provides a unique and timely overview of recent developments and broad orientations. Contributions analyse the domain and perspectives of NIE; sections on legal institutions, political institutions, transaction cost economics, governance, contracting, institutional change, and more capture NIE's interdisciplinary nature. This Handbook will be of interest to economists, political scientists, legal scholars, management specialists, sociologists, and others wishing to learn more about this important subject and gain insight into progress made by institutionalists from other disciplines. This compendium of analyses by some of the foremost NIE specialists, including Ronald Coase, Douglass North, Elinor Ostrom, and Oliver Williamson, gives students and new researchers an introduction to the topic and offers established scholars a reference book for their research.